We’d love your help. 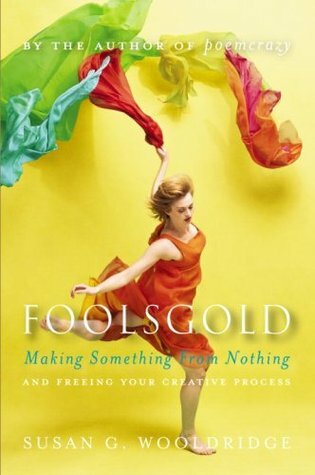 Let us know what’s wrong with this preview of Foolsgold by Susan Goldsmith Wooldridge. In this personal, inspiring guide to a creative life, Wooldridge shares her own journey of the heartâ��from loss and grief to a return to wholeness and joy. Offering poetry exercises, journal writing, and other practices to encourage creative playâ��including foraging and assembling collages with found objectsâ��Foolsgold: Making Something from Nothing and Freeing Your Cre In this personal, inspiring guide to a creative life, Wooldridge shares her own journey of the heartâ��from loss and grief to a return to wholeness and joy. Offering poetry exercises, journal writing, and other practices to encourage creative playâ��including foraging and assembling collages with found objectsâ��Foolsgold: Making Something from Nothing and Freeing Your Creative Process will motivate you to reevaluate whatâ��s most important in your world. To ask other readers questions about Foolsgold, please sign up. 3.5 stars. This was good (it's bristling with post-it flags), but not as good as Poemcrazy. It does tackle tough subjects, such loss, grieving, and feeling stuck. These are just some of the gems that I have found in this book and I also write about it in my blog on wordpress. Thank you Susan for taking me into a new world of understanding and freeing me from my hard-fast rules. I was really looking forward to reading this, since one of her other books, poemcrazy, is one of my all time favorites. I wanted to see what Wooldridge's take on creativity would be and if it could help me with the book I am working on. It disappointed me and didn't deliver. The sub-title, "Making Something from Nothing and Freeing Your Creative Process" is somewhat deceiving. It spends plenty of time discussing her creative ideas, but not very much about her creative process. I also think this w I was really looking forward to reading this, since one of her other books, poemcrazy, is one of my all time favorites. I wanted to see what Wooldridge's take on creativity would be and if it could help me with the book I am working on. It disappointed me and didn't deliver. The sub-title, "Making Something from Nothing and Freeing Your Creative Process" is somewhat deceiving. It spends plenty of time discussing her creative ideas, but not very much about her creative process. I also think this would have been stronger if she explored how other creative individuals approached the process. What works for one person doesn't necessarily work for a different person. When I finished A Book of One's Own: People and their Diaries, I wanted to read something diary-ish. I picked up The Red Leather Diary and was disappointed. THIS is the book I should have picked up first. The difference between the two is the difference between self-absorbed and self-supportive. I realize most people read this as a creativity how-to book. That was the intent of the author, and it does contain the now-obligatory "tips and prompts" at the end of the very short chapters. Frankly, I When I finished A Book of One's Own: People and their Diaries, I wanted to read something diary-ish. I picked up The Red Leather Diary and was disappointed. THIS is the book I should have picked up first. The difference between the two is the difference between self-absorbed and self-supportive. I realize most people read this as a creativity how-to book. That was the intent of the author, and it does contain the now-obligatory "tips and prompts" at the end of the very short chapters. Frankly, I didn't pay much attention to them because that's not why I was reading the book. I was drawn to it by Woodbridge's lovely way of playing with language and the imagery she uses to describe her surroundings and feelings. In the forward, the author says that this book came about as she was grappling with the death of her father and the end of a 30-year marriage. She writes about the process of coping with these changes, how she used spontaneous art (in form of collages) to process her emotions, and the way that art helped her grieve and move forward. My rating reflects my enjoyment of the book as a memoir, a peek into the intimate musings of a creative person who understands that art, no matter how humble its origins, can heal and that beauty is a matter of attention. I loved reading this book as much as I did Poemcrazy. Recommends it for: those interested in reading about how a woman remained creative during a time of loss. out of nearly 50 chapters meant to free the creative process, there were maybe a dozen i found useful or, at the very least, interesting to read. as many times as i've gone back to poemcrazy, wooldridge's other book, and found inspiration and suggestions i needed on dry or dreary days, i was sure foolsgold would be another essential member of my bookshelf. unfortunately, on the whole, it's left me very disappointed. this is not to say i won't read another of wooldridge's books or even that i wil out of nearly 50 chapters meant to free the creative process, there were maybe a dozen i found useful or, at the very least, interesting to read. as many times as i've gone back to poemcrazy, wooldridge's other book, and found inspiration and suggestions i needed on dry or dreary days, i was sure foolsgold would be another essential member of my bookshelf. unfortunately, on the whole, it's left me very disappointed. this is not to say i won't read another of wooldridge's books or even that i will never pick this one up again and skim a part i found useful when i need it, but there's a huge chunk in the middle that i probably won't revisit any time soon. It's nice, one of those books I bought when it came out and wanted to like... but then it sat on a shelf unread for eight years. I picked it up again and decided it's time to gift it to another reader. I wasn't the right audience, however i did like the chapter on making collage boxes, it was a short instruction and also an off the cuff retelling of a story, which i appreciated more than some huge long books of how-tos. The idea behind this book is great, but in practice it's pretty repetitive and it drags a bit. Susan Wooldridge definitely knows how to string words into a beautiful necklace. I really enjoyed her poems and will definitely be looking for her poetry books. But, this book got a bit dull. It seemed an ode to her journal. Not for me unfortunately. This book spoke to me. The words soared off the page.Inspiration and motivation were abundant. The author expertly explains the process of poetry , the practice of poetry and how it can make an impact on writers. I loved this second book by Ms Woolridge even more than the first...a must read for every poet or instructor of the craft. This ended up being a book that looked at both creativity and grief. It consisted of short essays. I expected more of an artist's manual, with exercises. I enjoyed the quotes at the beginning and end of each chapter. This book didn't resonate with me that much. I felt compelled to read it, but I think I've read a lot of books with similar themes. This book is great. But, I kept comparing it to Poemcrazy so that's the reason why I gave it 3 stars. It does have nuggets of wisdom and advice on creativity and poetry and writing. There are some dull and sad chapters in the book...so I had to skim through those. Yet another mediocre response. I promise there is a positive review coming. I am not always so disappointed by what I read. For a more thorough review, follow the link below. Susan Wooldridge's first book, Poemcrazy, is my favorite book of creative inspiration. Foolsgold, however, is a big disappointment. It has none of the wonder and magic of her first book, and is instead repetitive and dull. I highly recommend PoemCrazy. I do not recommend Foolsgold. This book made me think differently about my creativity and how I can share it better through art, or writing, or anything. Also read Poemcrazy if you want to see words in a whole new way. Nuggets of inspiration between the pages of this book but, like many other reviewers here, I found her other book Poemcrazy had more to offer. A little too whimsical at times. highy recommended by my friend Kari, www.artsymama.blogspot.com this look like one excellent book! Second reading. I like the beginning chapters best. This is a touching and inspiring and lively look at writing, loss and turning life into a beautiful fuel for words. Great book! Lots of inspiration and also I enjoyed the biographical aspect of this book, too.